In videos released today, ISIS says they will kill all Christians, Alewites and Kurds (they will be killing the Kurds who are not fighting for the Islamic State and Caliphate). Video: ISIS kills four Christians. The ISIS member says: "You Christians, today we kill you." Video: Five ISIS "Caliphate Cubs" execute Kurdish fighters trying to form a Kurdish state. The kids are of different nationalities who either have parents who went to Syria to fight with ISIS, or who sent their children to ISIS "Caliphate Cub" camps in Syria, where all children, as young as four, are trained to execute prisoners. ​From left to right the children's nationalities are Kurdish, Uzbek, Tunisian, British and Egyptian. ​The Narrator in the video gives this Message to the West: "We will be here until we enforce Islam and Islamic Law on all." 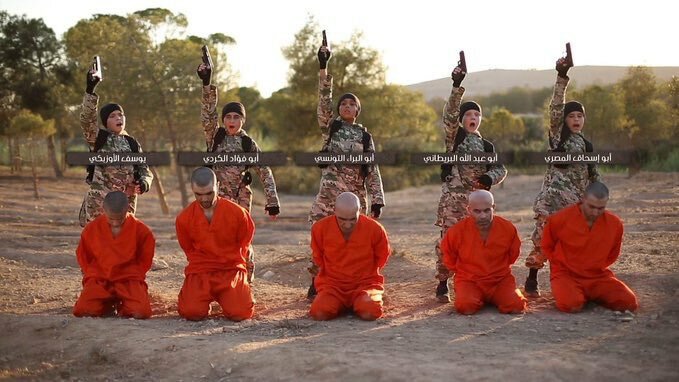 18+ Video showing 5 #IS Cubs executing 5 #Kurds in latest #IS video. ​Then one of the ISIS "cubs" says: "Kurds, you will find very bad days ahead. The war with you hasn’t even started yet. And no one will help you, not even America, Brittain or Germany. Dig your graves and prepare your coffins because your end will be like these men."